What a difference the sun makes. The coastal road to the north had sea and sun on my right, and hills and dark clouds on my left. At first it wasn't clear whether sun or rain would win out, the only wind being down the coast. But as the day progressed, the sun won, the sky and the sea turned bright blue, and my spirits soared. The spring in my step lasted quite a bit longer than usual before fatigue and foot pain took their usual toll. Golspie is the site of Dunrobin Castle, ancestral home of the Sutherland clan and a residence since the 1300s. Unlike hilltop castles, this one is near the beach. Its striking Scottish-baronial-style turrets, part of a remodel by Sir Charles Barry who designed the House of Commons, reach above the very mature trees which surround it and line the driveway off the A9. For the couple who have everything, 189-room Dunrobin Castle might be one thing more. And you might even get the county renamed from Sutherland to your name at the same time. But first convince the current owners to sell. The coast was not spectacular, but it was quite as nice as (and even resembled) the Oregon coast, though with fewer concessions to tourists. 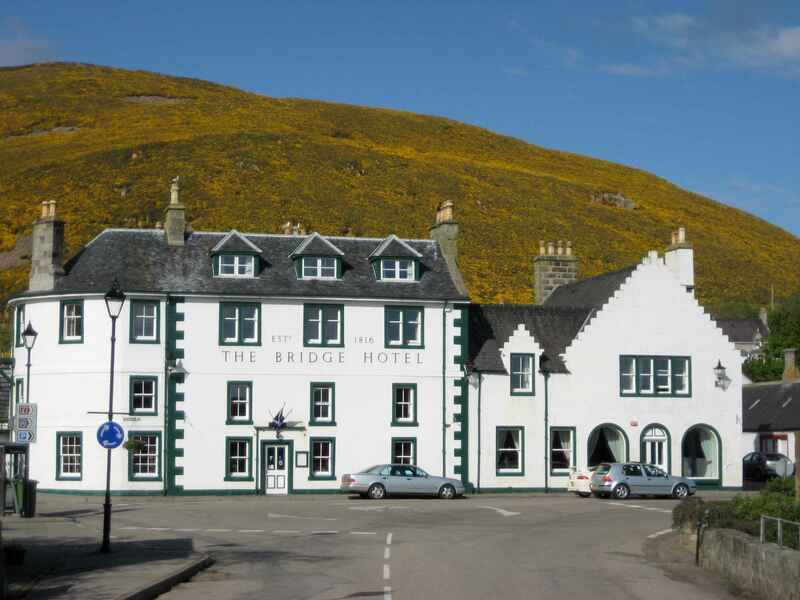 Brora, six miles north of Golspie, is another town with an award-winning beach - but after that there is little but sea, meadows with sheep, and hillsides until close to Helmsdale twelve miles on. Approaching Brora, the rail line crosses the road and takes a coastal path. At Helmsdale, it then heads inland. The coast all along here is most beautiful and unspoiled, and the rail line does not change that. But it presents a future problem, I thought. Here as elsewhere, the rail line has been built before the area becomes significantly populated, which also makes for a lightly traveled rail line, which people can step over to access the beach. But if and when the coast becomes more populated, and rail traffic increases, a rail line like this can become a major problem. New development will face the rail line, an eyesore and noise source, and people will get cut off from the beach except where underpasses or overpasses are built. This will channel coastal access to a few places that then become over-exploited, while depriving people of easy beach access in other places. A coastal rail line is almost never relocated. Its owners have a valuable asset on a permanent right-of-way close to revenue-producing coastal towns. To relocate the rail line would involve expensive engineering away from the revenue centers. Planning officials should think twice before they allow rail lines along the coast in the first place – but mostly it’s too late. Here in the Highlands, I hope this coast stays undeveloped anyway. I had grown fond of the sheep and their lambs – though I never detected an ounce of gray matter in any of them. The lambs were adorable, and the relationship between mothers and lambs was quite touching. It was sad to see an occasional mother standing next to a distressed or dead lamb. But I doubted that there’s any comfort that a human bystander could provide that these nervous animals could understand. My B&B at Helmsdale was next to the tiny, working harbor, and is called the Customs House, which I'm sure it once was. As I pecked away letter by letter typing this on my PDA in my room, the wardrobe mirror showed a tranquil and beautiful North Sea. I really could be looking at the Pacific on a calm spring day. After Dunbeath, there should be only 40 miles to go. That could be divided equally in two by over-nighting just south of Wick. On the other hand, those would be two very long days - and, in any case, I was quite interested in getting off the main road by going west through Watten. So I decided to take the days one at a time. There was no good reason to hurry, though I admit to doing my fair share of that so far. This evening in Helmsdale, I had some haddock and chips at The Wayfarer, and then a pint of 80/- at the Bannockburn Bar, and sipped it at a picnic table on the grass while watching the kids play soccer with their dads. Then I chatted to my B&B fellow guest, who is a single painter who weekends here because he loves the place. Plus, he pans for gold in a nearby river. 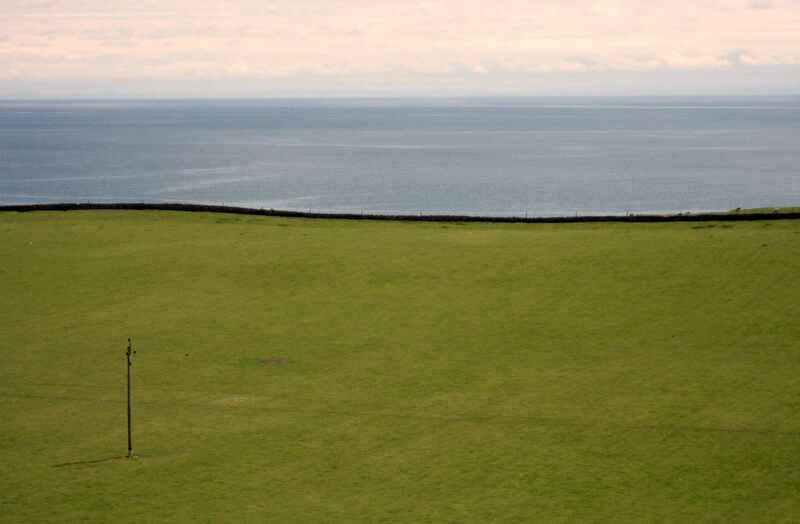 We sat on a bench (yes, indeed, such exist in Helmsdale) on a grass verge facing the harbor and the ocean beyond. Near the bench is a communal laundry line on public land. No one touches the clothes except their owners. No one steals the bench. No one locks his doors. There is no graffiti. There's no significant retail therapy for over fifty miles. But, wait, there's more:TV reception here is commendably bad. 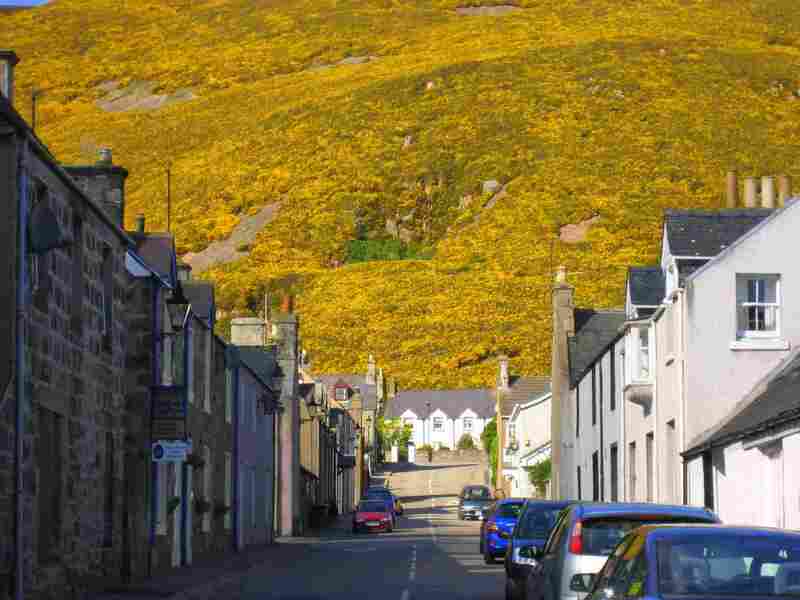 Maybe the world needs more villages like Helmsdale?